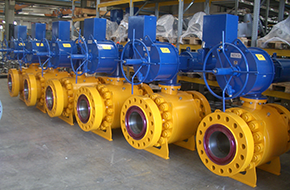 Della Foglia has been a “100% Made in Italy” ball valve manufacturer since 1962. A family-owned company with the goal of supplying customized high-quality performance products. In the last 20 years, it has made investments of millions of euros for new CNC machines, testing equipment and new facilities. Thank to these investments, Della Foglia succeeded to be listed in the most prestigious oil company vendor’s list such as Shell, ExxonMobil, BP, Saudi Aramco, etc. Five years ago, Della Foglia and RPV Group signed a long term agreement to meet the fast stock delivery needs of the market. Together they selected the ball valve materials (body, trim and seals) in manner to satisfy as much as possible the worldwide market needs. They prepared a specific valve datasheet for each and every product in stock to communicate to the client the suitability of the products. Thanks to this wonderful partnership and cooperation, Della Foglia and RPV are able to supply more than £25 million worth of stock ball valves from 2” up to 30” across the world.